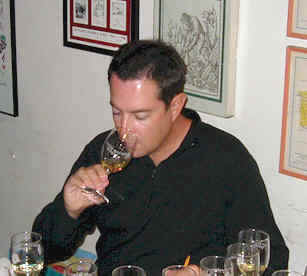 The "experts" regard the 1999 vintage as being exceptional for California Chardonnays. We had tasted a number of examples from this vintage at the San Francisco International Wine Competition and found many exceedingly poor wines. 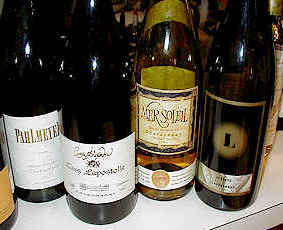 This tasting featured many famous wineries and famous vineyards. 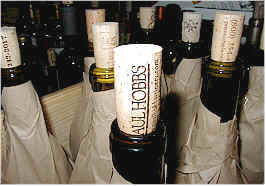 The prices asked for the wines reflects their scarcity and, in some instances, their quality. As a "mystery wine" or "ringer" (my German pals call this a "pirate wine"), we included a famous Chilean Chardonnay, a reserve bottling from Casa Lapostolle. This sells for about one third to one-fourth the price of some of the famous California wines. It had done well in previous vintages and I saw a good review of it somewhere. The results of the tasting are interesting. There was really no "run away" winner and all but one entry had at least one first place ranking. Each and every wine had a last place ranking. This demonstrates how relatively close in quality these wines are. 8th Place: PETER MICHAEL Sonoma County "Belle Cote"
"This has a nuance of lactic, lots of oak, leesy notes and is lactic on the palate with not a trace of fruit!" was the viewpoint of the first critic. Another person described this as metallic. Someone else pegged it as being reminiscent of "herbal tea and minerals." One person said "It's flat and uninteresting, with a hint of bubble-gum!" I found it a bit restrained and quiet on the nose, deciding it was refined and elegant. After a while, this blossomed and showed a nice bit of vanillin. It's big and rich on the palate, with a bit of a heat. There might even be a note of tannin that gives it a bitter finish (or is that simply the alcohol that's biting on the palate?). I'd rate it a one star wine on a three star scale (no stars being average or standard). I had tasted this earlier in the year and felt it wasn't Peter Michael's best work. 7th Place: PATZ & HALL Carneros "Hyde Vineyard"
"Melon, with honeysuckle notes...more floral...a different style from the other wines." said the first critic. Another taster described it as "lemony, high acid and hot." Someone else found it to "taste like chili peppers, with a bizarre, citrus, key-lime pie character...also it has a tart and bitter finish." Another taster found "lots of oak on the finish," while someone else felt "it got better as it warmed up." One other critic felt it is somewhat "leesy and has little fruit." I felt this wine might not be entirely Chardonnay. There was a very different aroma to this at the outset, the wine showing a fruity, almost tropical character that reminded me of some Viognier wines. Perhaps there's a touch of Riesling here??? I'm certain the winemaker will say it's 100% Chardonnay. The wine is big, fat, creamy, buttery and quite showy on the palate. One star. "This is quite minerally and not showing much presently." said the first taster. Another felt this was the "smoothest" wine of the tasting. Someone else got an "odd note, like shoe leather...also some cream and it got better with aeration." Another critic found it "Toasty and honey-like, with a sweet quality on the palate along with a bitter finish." One person described it as having "a lot of oak," while another found some "hints of oxidation. I don't think this will live long." Another critic found "the wood on the nose to be seductive, but it didn't come through as well on the palate." I found some minerally notes and a nice bit of oak to the nose. On the palate, it's a bit creamy and lightly oaked, but not especially profound. Half-a-star. 5th Place: MICHAUD "Chalone Appellation"
One person found this to be somewhat "Burgundian" in style, while another described it as having "nice, sweet, honeyed fruit." Another fellow likened it to a "Meursault" wine from Burgundy, since "it has some honey and nut elements." Someone else felt it "was low in intensity and it never developed in the glass." Another taster described it as being "flat," saying "it's one-dimensional with a bit of pineapple, mango and guava, but not very zesty on the palate." "Caramel and vanilla, sweet oak and some astringent wood tannins" were on display according to one tasting participant. Another described it as "oak-infused alcohol." Someone else founds lots of "butterscotch, with a long and somewhat astringent finish." Another liked the "Asian pear fruitiness and the creamy notes" but they weren't so thrilled with the "leesy, bitter character in the mouth." I detected a slightly metallic note to the fragrance with some toasty oak and a yeasty, bready quality that I thought to be attractive. The wine was quite good on the palate, with a bit of oak, but good fruit up front. The wood, I felt, gave added length to the finish. One star+. One vocalist cited its "sweet, toasty oak and citrusy fruit" amongst the positives, but found a "resin-like quality on the palate and a flat and flabby finish" that were negatives. Another taster thought the wine to be "attractive," while someone else found "melony, peachy fruit, a leesy note and some bitterness." One taster likened this to "apple pie a la mode," being intense in apple fruit and with a creamy, vanillin note. Someone else felt this had "the longest finish." I found stony, minerally notes up front, with a touch of pear-like fruit and pear "skin." The wine seems to have a touch of sweetness, though it tested below "threshold" in our analysis. I noted it as being "old fashioned California Chardonnay," because it has a slightly flat quality and yet crisp acidity (did they have to acidify, I wonder?). Lots of creamy and vanillin notes with plenty of oak. You certainly get your money's worth here! One taster described this as a "tropical fruit bomb." Another found it to have a "melon-like" character. Someone else thought it had some residual sugar. It has approximately six or seven grams per liter of sugar, so this was detected by a sharp palate! Someone else found "citric notes on the nose and palate" and they questioned as to whether or note the wine was acidified. One fellow found "spicy, cinnamon notes on the nose and it's nicely balanced." One other taster found "honey, chamomile and sweet, ripe pears with a long, lingering finish and enough acidity to finish nicely." I found lots of big, creamy, vanillin notes in this flashy wine. Plenty of toasty oak and vanilla cream, as well. I had a question mark as to whether or not it's dry. The same flavor characteristics of the aromas come through on the palate, making for a complete and lush white wine. One star+. 1st Place: LEWIS Napa "Reserve"
"Guava and tropical fruit" were detected by one taster, though another found notes of "burnt apples." A third person found "toasty oak," while another said it's "lactic with toasty oak and a grassy fruitiness and a bit over-oaked, though it's my first place wine." Another person echoed the detection of a vegetal note, saying they got a touch of a "fennel-like" character in the wine. I found this to be lightly toasty and showing some yeasty notes with plenty of vanillin oak on the nose. It's got the same features on the palate, being big, ripe, rich and oaky. One star+.